Sometimes, you luck out in liquor stores. And sometimes you don’t. But I have learned that it is worth trying it out. 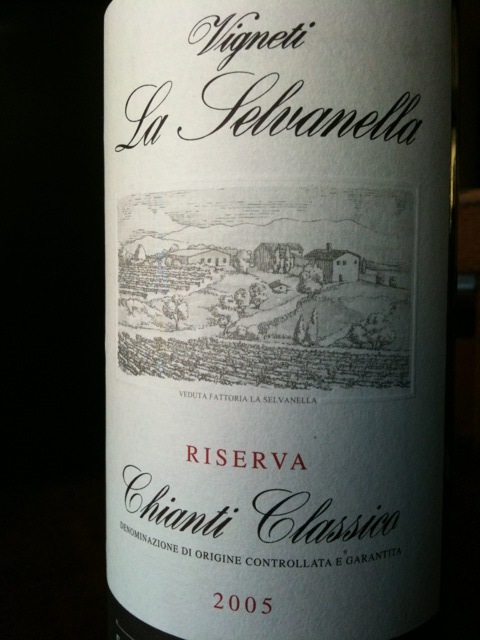 And with this find, the 2005 Melini Vigneti La Selvanella Chianti Classico Riserva, I definitely lucked out. According to Wine Searcher, the wine retails for $25 and up. I found this lone bottle on the sales shelf for $12. There is always a good chance that an older vintage wine sold in a liquor store (instead of a professional wine store) has gone bad because of poor storage conditions etc. But it is sometimes worth a try, and it all depends on what discount the store is giving you. Some of you know that I have made Melini’s 2010 Chianti Borghi d’Elsa my go to, everyday Chianti. It is nicely affordable and delivers refreshing, light wines. When bought in the magnum bottle, which are available at Costco, it is hard to beat price wise for a good dinner companion. We decanted the wine for about an hour. It poured as a darker red wine with very slight browning on the edges. In the nose, I got raisins, lots of plum and some sweetness as well as herbal aromas. The medium bodied wine showed mostly plums and prunes on the palate, with good acidity and medium tannins which were nicely round. There was some spice going on and it had a medium length finish. The wine was still very, very fresh, which surprised me. It is by far not nearing its end yet. I really enjoyed this wine. At the price I bought it, it was a steal. It also paired great with the Pecorino Toscano (a young Pecorino with delicate flavors that has none of the ripened Pecorino’s saltiness which I don’t enjoy much) I was able to secure in San Antonio and awesome different, thinly sliced bacons from my favorite sausage maker in town, Biercamp (which is right around the corner). It transported me right back into Tuscany, on a warm fall day afternoon, sitting outside, munching on Pecorino Toscano, prosciutto and panini and having a glass of wine…there is no better compliment I can make a wine. I hope you’ll be able to have wine again soon! great review as always and OMG, 12 bucks?!? That’s crazy cheap! Too bad they only had one left! A wine that can transport me to Tuscany? Sign me up! I love finding a great deal, not knowing what I’m getting into beforehand. Cheers! Done! Let me know when you’re in my ‘hood. Or I’ll give you a shout when I’m up in the chilly North! Anywhere would be great! Let’s just keep each other posted! I’m glad to hear that this Chianti worked out very well for you. While I haven’t had this particular one yet, I’m now looking forward to give it a try. Unfortunately, the winery is not present at VinItaly but maybe I’ll find the wine in a store or so. For 12$ it’s definitely a steal. I think the salty Pecorino that you don’t like is called Pecorino Sardo. Pecorino Toscano is considered milder and often eaten young. Yes, you are right. I am not a big fan of Pecorino Sardo or Pecorino Romano who are usually sold aged and quite salty. Pecorino Toscano, in contrast, is a totally different story. I hope you can find a La Selvanella. I would love to read your notes. Thanks for stopping by, as always! I can deal with the Sardo and Romano pecorino in pasta, but not on their own…Thanks for your kind words! I love those special finds! Nothing beats a good deal or a good Chianti! Sounds wonderful! I love how you always include background information on the wine/winery when you do your wine reviews! Salud!! Well done. Sounds like a good find!! Yes, it is fun when it works out! !